Solide is one of the major characters in Reiko-1o and has the dubious distinction of being the lowest ranked person on Reiko-10 as a lowly guard. While he hides the truth well enough, he has a hard time restraining his constant annoyance and being around people under him. Background: Few know the true past of a man whose actual creation name was Braid 713 Rano. The past most know from Solide is one that is a total fake that he had made up to avoid both anyone prying into a past ‘he wouldn’t talk about’ and to create one that had enough normalcy in it no one would bother asking him about it again. Braid was created to be a front line solider, and had all the typical traits associated with that: strong, aggressive, amazingly focused, accurate with weapons, and perhaps the trait that would eventually lead him to trouble to most: a strange fascination with pain and revenge. This would be critical when his unit was assigned to a mission that led to a majority of their deaths, and to which Solide found out had nothing to do with their promised mission so much as a combat test against a new threat that seemed unstoppable. Two men, Braid and one other person who had survived, eventually defeated the new threat. They were the only two to survive out of his entire unit of 25 elite troops. The other one was Kalco. Braid knows Kalco, but since Braid has received facial grafts and retina transplants Kalco does not recognize his old squad mate. It is a strange point of satisfaction in Braid’s mind that he will not let Kalco know he not only survived but was now with his old squad mate again, content to remain in silence about the incredible odds they had both surmounted. To go over the violence that led to his downfall would be unnecessary and bloody, but suffice to say that he left a trail of broken bodies behind him in his killing spree to take out everyone that had led to his unit’s death. He left a wide swath of destruction through the ranks; a swath painted in red and dotted with shotgun shells. Personality: A strong, abrasive, never-back-down type when challenged. For the most part seems like a fairly normal man, with maybe a touch on the cold side. He has no problem incriminating others for their shortcomings and failures. Engaging Solide in a conversation is generally a pleasure as he is fairly attentive to the discussion at hand. The reality however, is the persona Solide puts on is far different than his true personality he keeps repressed inside himself. He is drastically untrusting of others, and is ever looking ‘over his shoulder’ for any signs of betrayal he constantly expects out of others. Solide has taken up a point of pride in being the absolute best solider and thrives on the misery of death and pain he inflicts on others. His face lights up with a sadist streak as he pulls the trigger, distributing death, body parts and blood across the battlefield. He is deeply scarred by the incident he had survived earlier in his life and how much trust had been abused weighs on his soul deeply. 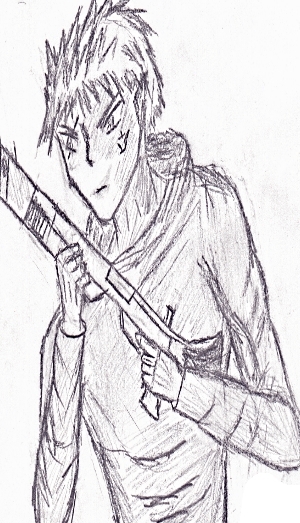 In the Reiko-10 game, Solide is one of three characters that start with a weapon, his named weapon Claim Jumper.